After a week in which Gary Neville's comments about their erstwhile flakiness made plenty of headlines, Tottenham came close to surrendering a three-goal lead at Wolves. They just about had enough to come through with a 3-2 win at Molineux - and are now unbeaten in 39 Premier League games against newly-promoted teams with 36 wins and three draws. It has been a busy week for Tottenham after covering so much ground against Manchester City on a poor pitch on Monday and then coming through a London derby against West Ham on Wednesday evening. The prospect of a trip to Molineux on Saturday night under the lights looked far from ideal. But Spurs came through the test and that says plenty. Already nursing a troubling injury list with Eric Dier and Victor Wanyama unavailable to Mauricio Pochettino, the sight of Mousa Dembele slumped on the turf within minutes of the kick-off presented the manager with a problem. He responded with a positive substitution - bringing on Son Heung-Min - and reaped the rewards with a clinical first-half display. 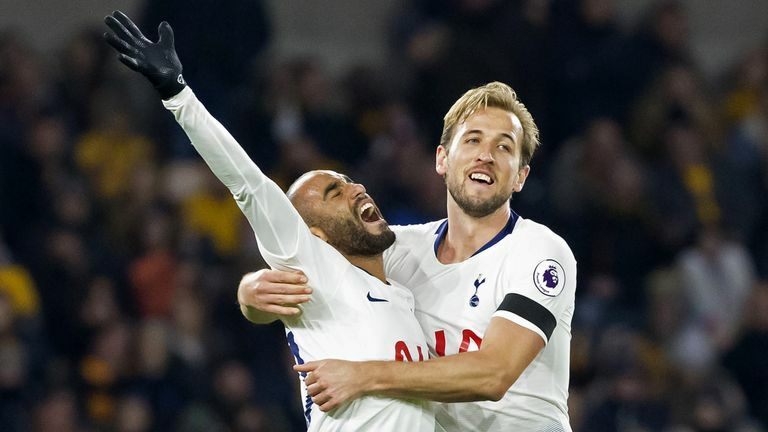 Harry Kane scored for the first time in four league games as Tottenham moved fourth with a nervy 3-2 win over Wolves at Molineux. "The plan was to go for the game and to put Moussa Sissoko with Harry Winks like a midfielder," Pochettino explained afterwards. "We knew that we were going to take risks but I think the team adapted very well." Wolves did have plenty of the ball and it was a rousing finale but ultimately it was Tottenham with the quality in the final third. Erik Lamela continued his recent scoring streak, latching onto Son's pass for the opener, and Lucas Moura headed home Kieran Trippier's cross to double the lead. Harry Kane got the third before Juan Foyth conceded a couple of penalties to make for a nervy finish. The mere presence of Foyth, on his Premier League debut, underlines that the squad is being tested. Pochettino did not feel able to select Davinson Sanchez for this game after calling upon him on Monday and Wednesday, describing it as a "big, big risk" to start him at Wolves given that he is likely to be needed twice next week too. As for Dele Alli and Christian Eriksen, neither started either. "We need to be clever in the way that we are going to manage it," he said. When asked last month about his team's injury issues, Pochettino gave a firm reply. "We are not victims," he said. "We must feel strong." That is how he seems to be approaching the challenge right now too. When the absence from the line-up of those so-called 'big players' Alli and Eriksen was brought up afterwards, Pochettino bristled in response. "For me, it does not exist the big player," he said. "For me, it is a big team, a big squad." He later added: "I don't know, I think we need to give more value to the squad. Nobody talks about Sissoko. Nobody talks about different players who are doing a fantastic job. Players like Ben Davies and Harry Winks. They are playing a lot. "Always we try to find the big player. All are big players. I don't like it when you say big players. I want you to talk about all players with the same respect. That's important because Tottenham is going to win with one or another name if we have the right mentality. With big names and no mentality we won't win, we will be weak and only names on the pitch." That is the culture that Pochettino has cultivated at Tottenham - the one that has been under the spotlight all week. "I am so happy that from the beginning when I arrived here we have created a very good culture about effort, fight and belief," he said when asked about Neville's comments. "It was difficult to create that." But now it seems that it's here to stay. "It is a team that is always going to give their best all the time," he added. "We can win or we can lose but we are so intense and today the effort was great. We came from Manchester City where we ran more than 120 kilometres and West Ham similar. Now the same. That means and shows that the team have a very strong character." Having lost three Premier League matches - as many as bottom-half Wolves going into the game - there has not been too much of a buzz about their season. 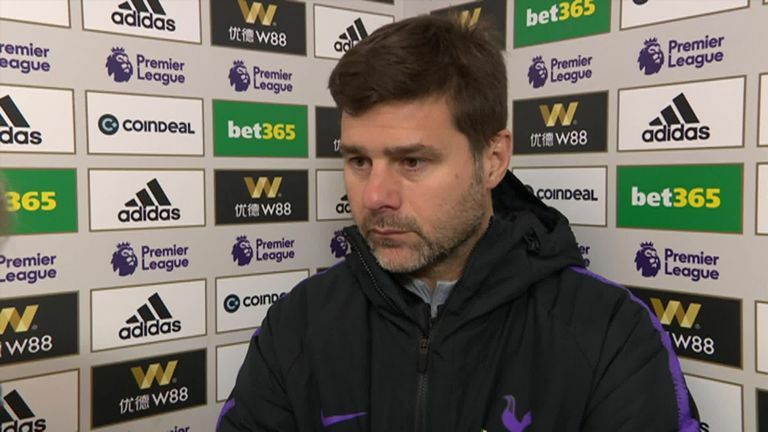 Pochettino seemed to share those sentiments himself when saying this was his "worst feeling" at this stage of the season. But despite those three defeats and the struggles in Europe, things are not so bad. If Tottenham win at Crystal Palace on Saturday, they will go into the international break on 27 points and in fourth place at worst. It has been a testing time and this game was no different. But Spurs are battling hard and running harder. The depth of this squad is under scrutiny right now. But for all the debate, nobody now doubts their resolve.